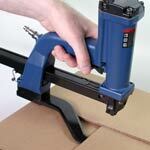 Bostitch P51CL-10B pneumatic plier stapler. C-Curved model ( Left C-anvil). New version of Bostitch P50CL-10B. Uses SB103020 fine wire interchange staples - 3/8", 1/2", 5/8". Special Application: for sealing partial overlap carton. Similar to Salco SP50CL-10B. Staples SB103020 3/8", 1/2", 5/8"
Bostitch SB103020 type staples 1/2-in length. Galv. 2,500/box. Salco brand. Bostitch SB103020 type staples 5/8-in length. Galv. 2,500/box. Salco brand.